Jane was among the most commercially successful groups in Germany in the seventies. The band was founded in 1970. After their appearance at the Little Woodstock Festival, Hannover in June 1971, a recording contract with Brain Metronome was secured. With vocalist Bernd Pulst they recorded Together in Star Studio, Hamburg in late 1971 with Konrad Plank. This was an impressive debut with a dominant guitar and organ style. Of most interest were the extended tracks "Spain" (11:53), "Hangman" (9:58) and "Daytime" (8:05). 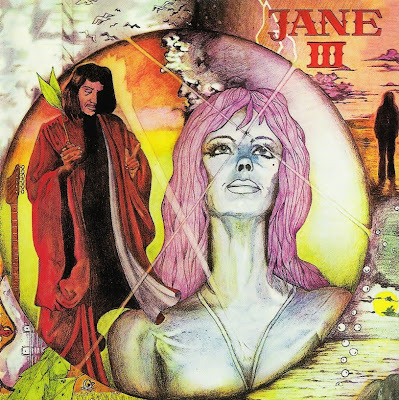 It is tempting to compare Jane's characteristic slow, classical influenced heavy rock arrangements to the music of groups like Vanilla Fudge, Iron Butterfly or early Deep Purple. Jane had developed these elements into a polished 1971 'progressive sound'. Indeed their patented rock sound wouldn't change too much during their long career. Some would say their music is far too predictable, easy-going and pompous. Label manager Gunter Korber produced Jane's first four albums. For many people, the low-point of Together had been the turgid vocals of Bernd Pulst. He quit Jane in April 1972 and reduced the group to a quartet. Just before Here We Are, recorded at Windrose Studios, Hamburg, Charly Maucher fell ill and was replaced by Wolfgang Krantz. This was another great album, featuring both long instrumental work-outs and some good shorter songs. The highlight was definitely the nearly instrumental opening track "Redskin" (8:54), which comprised slow heavy rock with guitar and organ reminiscent of Pink Floyd. The four tracks on side two revealed the rawer and heavier side of Jane. Quite a few people quote this album as their favourite by Jane. Although this music was dismissed by the reviewers, the commercial response was great. Jane, Eloy, Novalis and others enjoyed long lasting and/or increasing success with their accessible records. Merely a month after the recordings of Here We Are were finished, Nadolny quit to form his own band Lady. Maucher thus returned to Jane again and for a short while their characteristic organ sound was abandoned. On Jane III Hess and Krantz fought twin guitar battles instead, resulting in a more ordinary heavy rock sound. This album (recorded at Conny's Studio in February 1974) also opened with an excellent long and mainly instrumental track: "Comin' Again" (9:40). In general it was a highly enjoyable album. More changes in personnel followed in the Summer of 1974: Maucher and Krantz quit Jane to form Harlis. Their replacements were Martin Hesse and Gotfried Janko (previously the leader of Dull Knife). Janko brought back the organ sound for the album Lady (recorded at Conny's studio during November 1974 and January 1975), but also brought in some rather misplaced gospel-soul vocals. One felt that this album was an attempt to continue their increasing success with easy-going heavy pop. Luckily enough former organist Werner Nadolny soon replaced Janko again. The concept album Fire, Water, Earth & Air was a more rewarding album than its predecessor. It was their first self-produced one, recorded in dummy-head stereo at Plank's studio in November 1975. Synthesizers were now introduced, resulting in a typical late seventies symphonic sound. For a large tour in March 1976, Nadolny had quit again. This time the replacement was a better choice than in the case of Janko: Manfred Wieczorke, previously of Eloy. His first recording with Jane was a double live album: Live At Home (1976). It was recorded in their hometown of Hannover in August. As with most other live albums, it was mostly of interest for fans and quite superfluous for others.